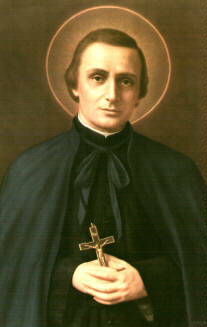 Saint Peter Chanel was a Marist priest, missionary and martyr. His feast day is on 28 April. Born in France in 1803, he did pastoral work there for a few years after ordination, and then entered the Marist Society and was sent to Oceania. There was considerable resistance to missionaries at that time, though he did receive a few converts into the faith before he was clubbed to death on the island of Futuna in 1841. He was 38. His photograph is displayed on the right hand side of the Church. Pierre Louis Marie Chanel, or Peter Chanel, (12 July 1803 – 28 April 1841) was born in La Potière near Cuet in France. Son of Claude-François Chanel and Marie-Anne Sibellas, he was the fifth of eight children. From about the age of 7 to 12 he worked as a shepherd. After some schooling at a local school Saint-Didier-d’Aussiat his piety and intelligence attracted the attention of a visiting priest from Cras, Fr. Trompier, and he was put into Church-sponsored education at Cras in the autumn of 1814. He made his first communion on 23 March 1817. It was from that time that his attraction for the missions abroad began. His interest was the result of reading letters from missionaries sent back by Bishop DuBourg from America. He later said, “It was that year that I formed the idea of going to the foreign missions.” He followed this with seminary training from 1819, at the minor seminary at Meximieux where won several awards and class prizes in Latin, Christian doctrine and speech and Belley in 1823, and then in 1824 at the major seminary at Brou. He was ordained priest, along with 24 others, on 15 July 1827 by Bishop Devie, and spent a brief time as an assistant priest atAmbérieu. At Ambérieu he also read letters from a former curate from that parish who was at that time a missionary in India. The following year, Chanel applied to the Bishop of Belley for permission to go to the missions. His application was not accepted and instead he was appointed for the next three years as parish priest of the run-down parish of Crozet, which he revitalised in that short time. His zeal was widely respected, and his care, particularly of those in the parish that were sick, won the hearts of the locals, who began again to practice their faith. During this time, Chanel heard of a group of Diocesan Priests who were hopeful of starting a religious order to be dedicated to Mary, the mother of Jesus. In 1831, Chanel joined the forming Society of Mary (Marists), who would concentrate on local missions and foreign missionary work. Instead of selecting him as a missionary, however, the Marists used his talents as the spiritual director at the Seminary of Belley, where he stayed for five years. In 1833, he accompanied Fr. Jean-Claude Colin to Rome to seek approval of the nascent Society. In 1836, the Marists, finally formally approved by Pope Gregory XVI, were asked to send missionaries to the territory of the South West Pacific. Chanel, professed a Marist on 24 September 1836, was made the superior of a band of Marist missionaries that set out on 24 December 1836 from Le Havre. They were accompanied by Bishop Jean Baptiste Pompallier who was to become the first Bishop of New Zealand. Chanel travelled to the Canary Islands, Tonga and Futana in 1837. The group was initially well received by Futana’s king, Niuliki. Once the missionaries learned the local language and began preaching directly to the people, the king grew restive. He believed that Christianity would take away his prerogatives as high priest and king. When the king’s son, Meitala, sought to be baptised, the king sent a favoured warrior, his son-in-law, Musumusu, to “do whatever was necessary” to resolve the problem. Musumusu initially went to Meitala and the two fought. Musumusu, injured in the fracas, went to Chanel feigning need of medical attention. While Chanel tended him, a group of others ransacked his house. Musumusu took an axe and clubbed Chanel on the head. Chanel died on 28 April 1841.